What goes around comes around, even if takes better than 25 years. Set The World On Fire finds vocalist Johnny Gioeli (Hardline, Axel Rudi Pell) reunited with drummer Deen Castronovo (Journey, Revolution Saints, The Dead Daisies, et al) for the first time since Hardline's 1992 album Double Eclipse. Their debut album features Frontier Music's Alessandro Del Vecchio on keyboards, Nik Mazzucconi from Labyrinth and Sunstorm on bass, and Hungryheart's Mario Percudani on guitar. Considering their extensive musical history, you know what you'll get from a Gioeli-Castronovo partnership: classic AOR melodic hard rock. Expect to hear fine melodies, smooth vocal harmonies, catchy hooks in refrains, ambitious drums, and oodles of sizzling guitar solos. The album starts off with the title track, probably the heaviest song here, a fast paced melodic hard rocker. Things quickly turn to the AOR side with Through, which turns on a smooth groove and steady drum line before rising stronger with the refrain. Several songs turn on a piano or acoustic guitar line, sometimes both. You'll find this within the anthemic ballads It's All About You and Walk With Me, and the AOR rocker Ride Of Your Life, where the piano lilts and lingers throughout the tune. You get a return to something slightly heavier with Remember Me, which develops from Castronovo's drum line mingled with synths for another steady AOR rocker. The album concludes with Let Me Out, essentially a break up song with Gioeli singing over acoustic guitar and a touch of synths. So it seems like old times. The renewed Gioeli-Castronovo partnership is a fine one, and Set The World On Fire is a solid album of entertaining AOR melodic rock. Recommended. So it seems like old times. 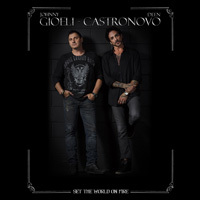 The renewed Gioeli-Castronovo partnership is a fine one, and Set The World On Fire is a solid album of entertaining AOR melodic rock. Recommended.